A pro-Justice and Development Party (AKP) Twitter troll has called on the government to make plans for the massacre of all Gülen sympathizers who are currently behind bars in the event of a second coup attempt in the country. Responding to a claim voiced by retired Col. Atilla Uğur in the Yeni Şafak daily on Sunday suggesting that Turkey should get ready for a second coup attempt in November carried out by sympathizers of Fethullah Gülen, a Turkish Islamic scholar based in the US, a Twitter troll named Ahmet Üstün (@ustunn_ahmet) posted a series of Twitter messages from his account on Sunday in which he called on the government to kill all Gülen sympathizers currently in jail. “All the necessary measures should be taken for the immediate killing of all FETÖ members in jail in the event of a second coup attempt. There should be no other inmates in the prisons where FETÖ members are jailed. Special execution teams should be deployed there. FETÖ and its jailed members should know that only the dead bodies of FETÖ members who make escape plans can be taken out of jail. The guns of prison guards should be taken away, FETÖ members including military members, police officers, prosecutors and judges should be collected in one or two prisons. PÖH [special police units] should operate with the authority to kill 24/7,“ wrote Üstün in a series of tweets. 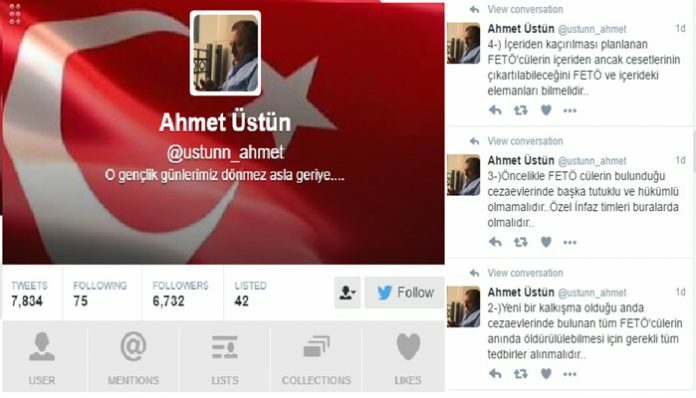 Üstün also threatened Twitter users who reacted adversely to his tweets and called on prosecutors to take action against him. Turkish Islamic scholar Gülen called for an international investigation into the coup attempt, but President Erdoğan — calling the coup attempt “a gift from God” — and the government initiated a widespread purge aimed at cleansing sympathizers of the movement from within state institutions, dehumanizing its popular figures and putting them in custody. Known for his anti-American stance, Üstün also told President Erdoğan in a Twitter message in 2015 that he was ready to carry out a suicide attack at the US Embassy in Ankara upon his orders. In the meantime, Fatih Tezcan, a pro-Erdoğan journalist with 435,000 followers, claimed in a recent analysis that the Gülen movement has transferred thousands of members from Cyprus, Iraq and Syria to Turkey in collaboration with the CIA and prepared for another coup attempt that will end up with an internal war, followed by a NATO intervention. Tezcan further said in his tweets that they would show no mercy in the case of a second attempt. Anti-Gülen movement and anti-Western conspiracies that started to be pumped up following the eruption of a corruption scandal in late 2013 in which senior government members were implicated were revived after the July 15 coup attempt. Turkey’s Deputy Prime Minister Nurettin Canikli argued on Saturday that the Gülen movement could have played a role in Moody’s downgrading of the country’s sovereign credit rating to non-investment grade, reaching new heights in holding the movement responsible for any and every problem Turkey experiences. This article originally appeared in Turkish Minute on September 26.